Day 2 in Savannah - a gorgeous day! We went early enough in the year to miss the humidity - yay! - and Friday was a beautiful, clear blue sunny sky day. We started off with a trip to River Street. 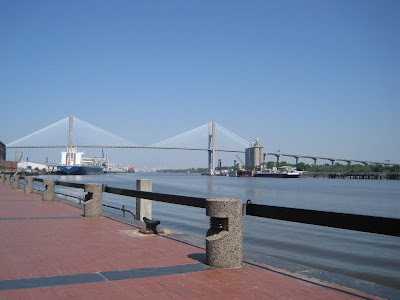 We walked both along the river, enjoying the sights of the river, bridges, boats, barges, and some historical markers, and along the side with shops & restaurants. We were also pleasantly surprised to discover that the Fine Arts on the River Festival was going on along the river. 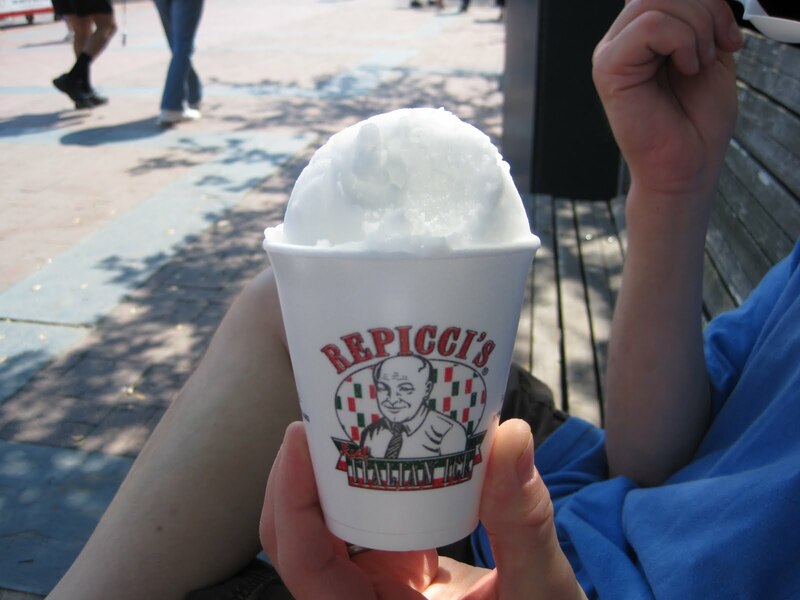 We had a nice time looking at the artist's booths and when we got a bit hot from the bright sunshine, we shared a lemon icee. We bought ourselves a pagoda wine rack made of old red wine barrels. 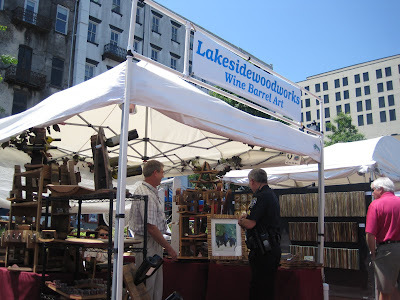 The artist was so friendly and talkative; we must have spent about 10 minutes talking with him and he told us about a bunch of wineries near Dahlonega, GA, which is where my brother lives (we didn't go to any last summer when we were in Dahlonega). If you look closely, you can see the wine rack we purchased! Next up, we decided to find a carriage ride, which we thought might be impossible because the carriages are so high off the ground - we figured I wouldn't be able to get into one. However, the night before when we were at City Market, we talked to a couple of carriage drivers, and they said they'd carry me up into the carriage if I was OK with that! We found the same people from the night before and they did indeed carry me up a ladder/step-stool into the carriage! 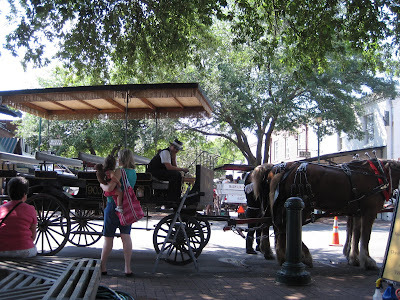 Many thanks to Carriage Tours of Savannah for going above and beyond to make my day wonderful! Carol was an amazing tour guide. 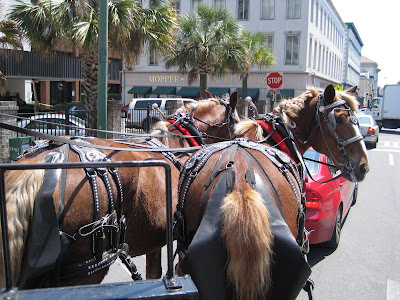 Her horses were Babe & April: A carriage ride is a lovely and informative way to see Savannah. The buildings are so beautiful and there's so much history, including the house where Juliet Gordon Lowe grew up (the founder of the Girl Scouts). Apparently it was quite scandalous when she let some girls play basketball in her backyard garden - and their legs were showing! 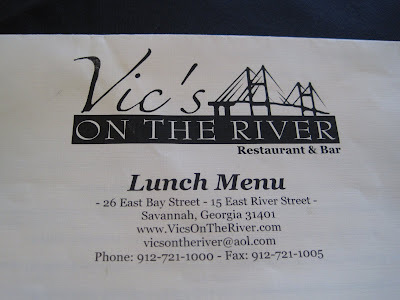 After the carriage tour, we were hungry, so we decided to have a late lunch/early dinner at Vic's on the River. Vic's has two entrances, one on River Street and one 'up' on Bay Street. The River Street entrance is wheelchair accessible and guests take an elevator to the fourth floor restaurant. The restrooms are on the third floor. Since it was around 3:30 pm, it was not too crowded, which I think was nice. We both ordered Yankee iced tea (unsweetened). 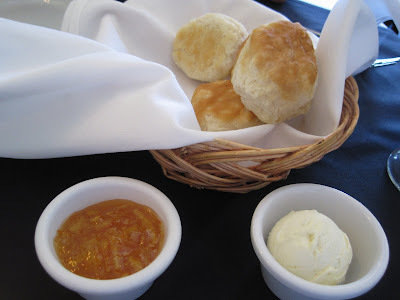 The bread basket was actually small biscuits served with orange marmalade and butter: They were tasty and naturally I got myself all sticky with marmalade! 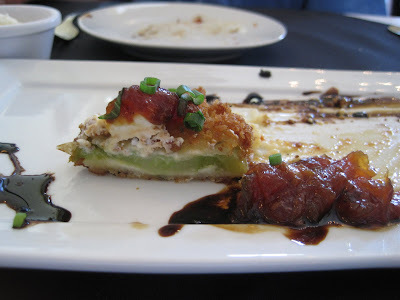 For our appetizer, we continued our 'tour' of Fried Green Tomatoes, this time with goat cheese and tomato chutney and a balsamic sauce: Oh my gosh - these were delicious, too. No crab like at Moon River Brewing, but the goat cheese and tomato chutney and balsamic made for an amazing taste. 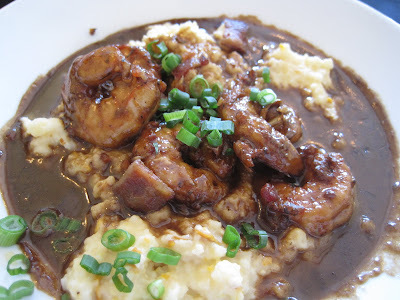 For my meal, I decided to try Local Shrimp & Smoked Cheddar Stone Ground Grits with smoked bacon and rosemary barbecue for my meal: Oh my gosh. So good. The rosemary BBQ was so tasty, the grits lovely - all these flavors together were just so darn good. I ate it all! 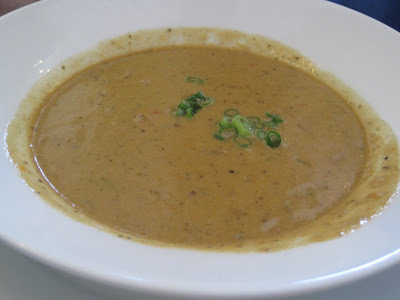 SP decided to have Shrimp Gumbo Soup, fresh local shrimp, andouille sausage and okra: And Spinach Salad with baby spinach, Granny Smith apples, applewood smoked bacon, tossed in a honey mustard vinaigrette with roasted butternut squash and a parmesan custard: His soup was too spicy for me (peppery) but he liked it a lot. 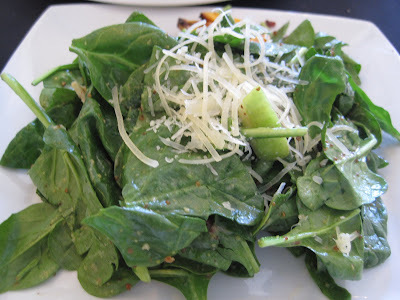 He also thought the salad was very tasty. We were too full for dessert. After Vic's, we stopped back at the hotel for a quick break, then decided to take a walking tour of the squares. 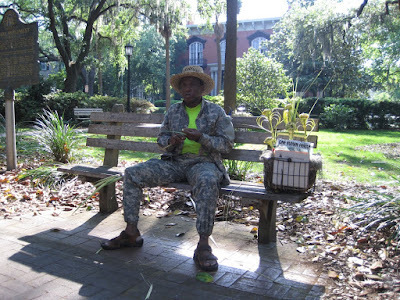 In almost every square in Savannah, there is someone making sweetgrass roses and trying to get you to 'buy' one (it made me think of upscale panhandling!). This man told us a story and made a rose behind his back - we gave him some money and I left with a sweetgrass rose. We walked down Bull Street and through the squares, shopped in some shops. 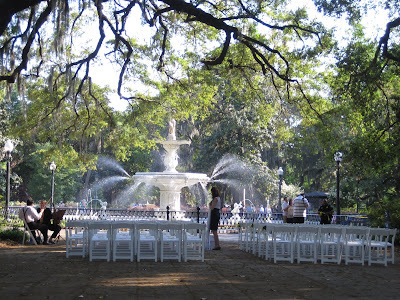 We ended up at Forsyth Park, a lovely park, and at the main fountain there was a wedding: I've always thought an outdoor wedding would be lovely, but the weather in Pittsburgh is too unpredictable, especially in April! I couldn't even have a cocktail hour outside at my wedding!!! After walking around for quite a long time, we decided we wanted drinks/dessert. We tried Rocks on the Roof at the Bohemian Hotel but it was way too loud (music and patrons) then we tried Rocks on the River but despite many empty tables outside and inside we were told there was a 45 minute wait - ?! 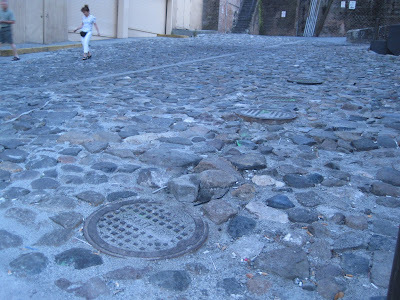 We walked some more along River Street, but it was crowded and since the street is the original - yes, original - cobblestone, it's not wheelchair friendly. In fact, most sidewalks in the historic district are uneven/bumpy and the curb cuts are, well, not exactly curb cuts. Every day was a bumpy ride for me and an effort for SP to get me over all the uneven sidewalks. 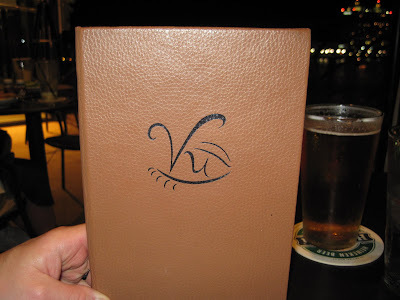 So we went back 'up' from River Street to W. Bay Street and went to Vu Lounge at the Hyatt: We sat outside on the balcony and had a wonderful view of the river and River Street. 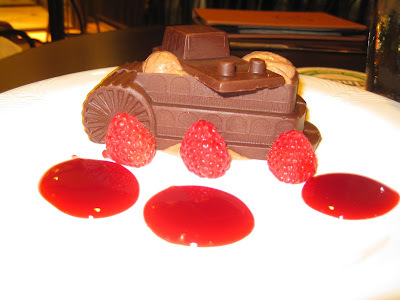 SP ordered a beer and I had a glass of Shiraz and we shared the River Mousse desert: Tasty chocolate mousse in a river boat shaped chocolate with raspberries and dollops of raspberry sauce. 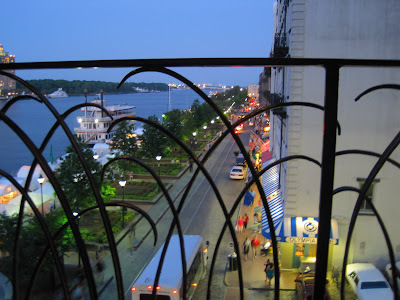 It was nice to relax above the 'action' on River Street (yes, we had a good time laughing at the idiotic women teetering across the cobblestone street in high heels). 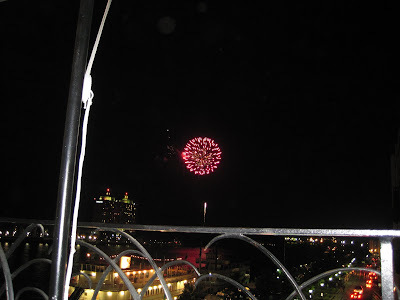 Just after the sun set, there were fireworks - a nice surprise. I think they were part of the Fine Arts on the River Festival. We slowly wandered back to the hotel after a busy and wonderful Day 2! sounds wonderful! I have always wanted to travel to savannah and charleston!